The best fish cutter I've ever seen! My wife Pam and I were missing our regular saltwater fix, so on the spur of the moment we decided to come down off the mountain and go fishing for rockfish out of Port San Luis in Avila Beach. We had no trouble making a last minute reservation for an all-day trip on the Pacific Horizon out of Patriot Sportfishing, so we got underway. The boat departed at 0600, and we were requested to check in by 0500. We went down the day before and stayed overnight at one of the numerous motels in Pismo Beach to make travel easier. 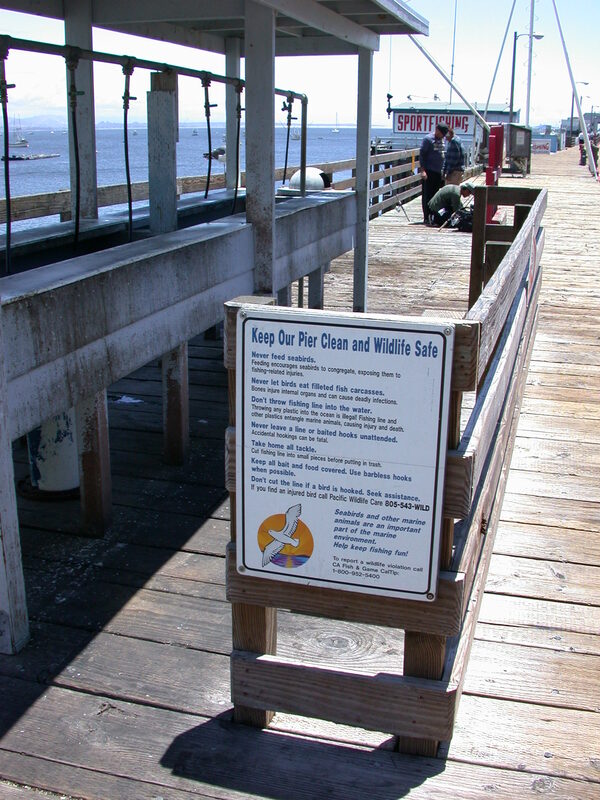 In the morning it was only a 15 minute drive to the pier located at the end of Avila Beach Road which is accessed off the freeway just north of Pismo and Shell Beach. When we arrived we were among the first to check in at a small but well stocked tackle shop at the foot of the pier. The staff there was friendly, knowledgeable and helpful, answering questions as people checked in. Most of the locals showed up later, at about 0530, and we ended up with 23 anglers on the boat. The Pacific Horizon is a well maintained, broad-beamed 65 foot vessel, and with only 22 passengers we were all able to all fish the same side of the boat on the drift. That helped cut down on tangles, and made fishing more comfortable. There’s a hot galley available, but on our trip the deckhand was also the galley cook, which meant that you couldn’t get your breakfast burrito until he’d finished cutting up squid for bait. When we finally scored one though, it was delicious. We fished off Point Sal, about 90 minutes away, so there was plenty of time to rig up on the way out. There was also plenty of storage for extra rods and tackle boxes for those of you who like to be well prepared. The area we fished varied in depth from 95 to 110 feet, but you still needed a heavy sinker because of the current during the drift. The wind came up early in the afternoon and helped us move over the ground even faster, but with 1 pound sinkers and shallow water, there was no problem staying close to the bottom. The crew was very helpful with tangles and with unhooking fish for those who were reluctant to stick their thumbs in the mouth of their catch. There was tackle available on board if needed, and the galley was available between drift. The burgers were tasty, the beer and colas cold, and everything was served up with a smile. We had no trouble catching our limits of rockfish early. Twelve of our fish were reds and the rest browns. Some of the people fishing with us took care of the bolina that we inadvertently snagged, so that helped give us a nice bag of tasty critters. The fish did run on the small side though, but that didn’t deter from our enthusiasm. There were a number of ling cod caught, with about 20 percent being legal. We caught three and released three, but we weren’t targeting lings. Those that did sharp shoot for those toothy critters boated nine legal fish with the largest weighting out at 16.5 pounds. After weighting it, the lucky angler released it. The boat has a policy of giving a free trip to anyone who releases a fish over 16 pounds, so if you elect to fish here, the big one is still down there. The dock has a cleaning station next to the landing, but we elected to have our fish filleted on the boat. The charge was $1 per fish, and well worth the price. I was really impressed with the cutter. He was the fastest and best I’ve ever seen, and did an excellent job taking off the belly bones and skinning the filet but leaving the skin lightly attached to make it legal. One funny thing happened. The process was that you dumped your bag out on the cleaning board and the deckhand went to work. He dropped your fillets in a bait well with running water to flush them clean. You picked them up there yourself, and dropped them into a plastic bag that was provided. Well, this one passenger was picking up his catch out of the bait well and pulling the skin off each one, tossing it overboard, making them illegal. The deckhand caught him after about four skins were tossed and got him squared away on the rules, and we all had a laugh. Pam and I enjoyed this trip, and we plan on doing it again after we finish eating the 20 two-person dinners we freeze wrapped after we got home. It’s meat fishing, but the shallow water negates it being work, and the fish do fight all the way to the surface. We started with the standard two-hook rig, but ended up using a one-hook, longer drop line and that made it similar to fishing for sand bass. We recommend this boat and crew. They were cheerful and helpful, and we definitely enjoyed our day. 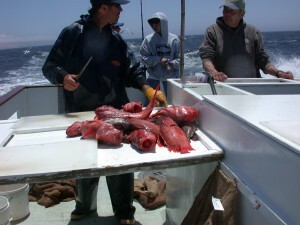 You can check out Patriot Sportfishing on the web at www.patriotsportfishing.com. This entry was posted in Salt Water Fishing and tagged Port San Luis, rockfish, saltwater fishing, shallow-water rockfishing. Bookmark the permalink.